Thank you so much to everyone who filled out our customer satisfaction survey! The winner for Q2 is Nikita, a Quality Process Engineer in the baking industry. Thank you Nikita! Quality Process Engineers in the food manufacturing industry optimize the production processes from a purity and efficiency perspective while ensuring food safety, productivity and quality of the product. TRI Air Testing provides independent laboratory support for many food, beverage and packaging companies. We offer 24-hour turnaround time and online laboratory reports via MYAIR. 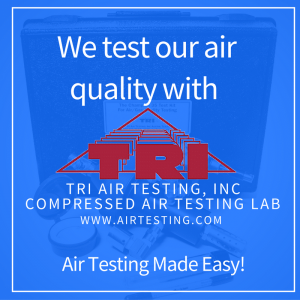 SQF Managers use compressed air testing equipment provided by TRI to collect compressed air samples as part of their facilities’ air quality compliance, safety and SQF food safety programs. TRI is committed to providing the most professional, courteous, and efficient customer service possible. Enter our quarterly contest to win a $50 Visa card just by completing our survey! http://airtesting.com/customer-service/ We will be picking another winner soon!